Back on dry land, he continued in groundcrew until the second year of the war, when he volunteered for aircrew training, and was selected as a specialist bomb aimer. At the end of his course he had done well enough to be offered a commission and so it was as a Pilot Ofﬁcer he arrived at No.10 OTU in September 1942, at RAF St Eval. 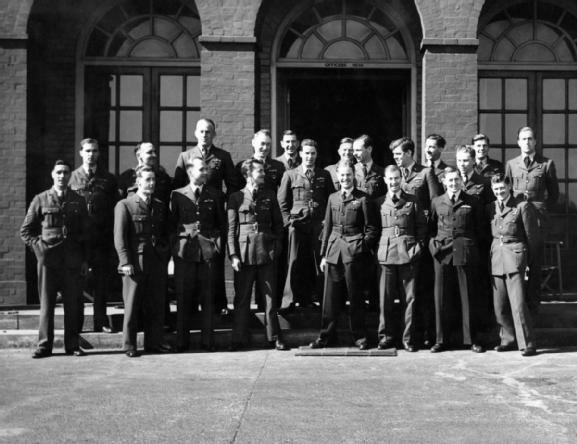 After completing the course there, where he also met Vivian Nicholson and Antony Stone, he went with them to 1660 Conversion Unit, and on to 207 Squadron, finally ending up at 97 Squadron, where the whole crew joined up with David Maltby. Fort was one of the most proficient bomb aimers in 617 Squadron, and was the A Flight bombing leader. Not all the bomb aimers used the wooden triangular sight devised by Wg Cdr Dann, but Fort did and his was given to David Maltby’s father Ettrick shortly after the raid. It is thought to be the only such sight still in existence. Fort’s accuracy paid dividends on Maltby’s run in to the Möhne Dam, and the crew’s mine made the second larger breach which caused its final collapse. Afterwards there was jubilation, and John Fort joined in the celebrations with much gusto. In the pictures which show the squadron personnel getting on the train to London for the investiture, he can be seen messing about on the footplate. After the crash on 15 September 1943, in which he was killed along with all his other comrades, squadron adjutant Harry Humphries, who was a good friend, wrote a short pen portrait which is preserved in the archives at Grantham Museum. A Lancastrian with an outlook on life difficult to beat. Good humoured, slow of speech, but quick in action. A small fairhaired chap, with broad shoulders, well able to carry their responsibilities. He had been in the Service for some years and often said it was a “piece of cake” compared with the competition & throat cutting of civilian business. A very popular member of the Squadron. John Fort has no known grave, and he is rememembered on the Runnymede memorial. Thanks for your hard work on this Charles, if you had not started we wouldn’t know what we do now. My Grandfather seldom talked about the war, and his brother John was away a lot, we have learned so much from your blog look forward to seeing you tomorrow 16th at Scampton my father John is also coming Regards Peter Fort.